POINT ONE: When he took the reins of BP (that does not stand for Bloody Petrol) he immediately weeded out all those people who, and I quote, “….wanted to save the world.” Saving the world is not the goal of business, making money is, and no one can say that Mr. Hayward didn’t make money for the investors of BP. Score one for the British! They’ve become as obsessive about profit as the an American conservative! POINT TWO: After the fire and rescue of the victims from the platform Mr. Hayward’s legal team leapt into action to detain the survivors until they signed a release saying that they were not injured…which, in legalese is to say they were signing a waiver of all liability, not a just that they were not physically injured, but that BP could not be sued for any mismanagement, negligence, etc. This reflects devotion that Mr. Hayward and his team have for the investor. Duty first and last! POINT THREE: Within hours of the disaster BP’s crack crisis response team sprung into action securing all information and potential access to protect the corporation from negative portrayals by the world media. First there was no oil leaking, then only 5,000 barrels, then, well, no comment. Carefully crafted statements were released to reassure the investors, (not the public,) that the event was a minor setback and the amount of oil would have a minimal impact on the excessive amount of water in the Gulf of Mexico. Textbook Public Relations work! POINT FOUR: Unfortunately, BP could not hide massive oil slicks from the cameras of the media and that could scare the investors…but wait a minute…they could hide them by pouring millions of gallons of toxic dispersants on the oil at the point of origin! Yes, it would make collection the oil impossible, but that was save-the-world thinking, and this was not the time to shirk the duty to the investor with ethics. Again, Mr. Hayward shows us his stuff! 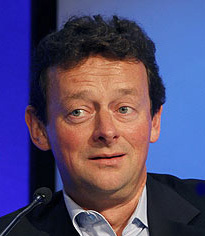 POINT FIVE: The pièce de résistance (my apologies to the British for resorting to French) was the yacht race that Tony Hayward took leave of the United States to attend. As outrage among the American public reached a fever pitch it was a stroke of genius by a perfect corporate executive to again restore order with the investors by demonstrating that this oil spill event is all much ado about nothing and normal aristocratic life is alive and well in this man’s corporation. It is true that not since King George III have the average, non-conservative American been so incensed with a British national, but the public is passé (again my apologies for using French) in the corporate world, especially in the world of big oil companies. The public will trade ethics for petrol (I’m trying to compensate for using French by using British words) any day of the week. The public’s role is to buy their product, not tell them how to obtain it. 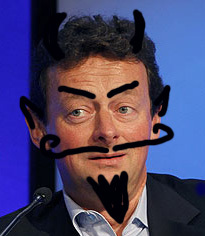 Tony Hayward has been true-blue to the investors…I wouldn’t be surprised if his urine is blue! No one can dispute that as a model of the corporate executive, Tony is the best of the best.